As you know, the Bangles joined the Dutch Reformed Church of Stone Arabia in 1765 in today’s New York State. By settling in Terrebonne, Québec, Catherine Bangle and Jacob Smith had their children baptized in the Catholic Church, but they never abandoned their faith. Neither did John and William, although their children, born to a Catholic mother, were baptized according to the Roman Catholic rites as well. The absence of a Protestant Church in Terrebonne, the social pressure, and maybe the insistence of the priest might explain why these three couples chose to have their children joined the Catholic Church. Are you confused with the various names mentioned in the Bangle Files’ posts? Since the beginning, I have mainly written about the people of the first three generations. Who are they? * Relationships yet to be confirmed; still under investigation. Deceased infants have not been listed. Well, I am not done yet with the St. Louis Daily Globe-Democrat. Oneida Alexander is another one who escaped the radar of the census for the period between 1880 and 1900. 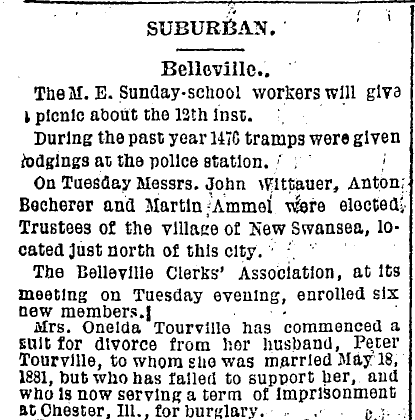 Oneida married Peter D. Tourville in St. Louis, Missouri, on May 18, 1881. 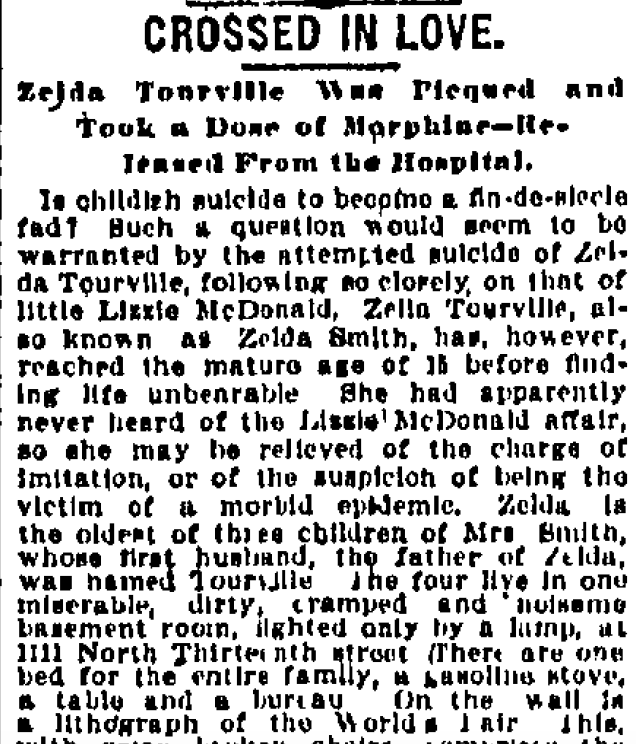 We know for sure they had one child, Lillie M. Tourville, as the latter weds Julius B. Seitz in Belleville, St. Clair County, Illinois, on March 19, 1903, and that is quite all I have learned about her. 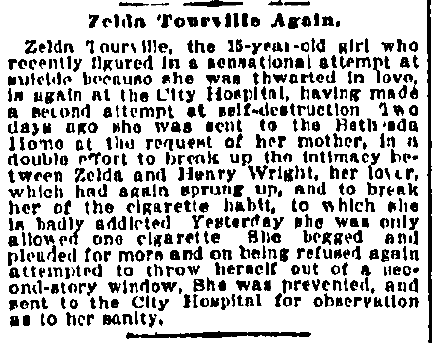 As a French-Canadian, I tend to forget that divorce was allowed in those years in the United States, so I had assumed she died before 1891 as Peter D. Tourville was remarried to Lockie Wadkins (date and place unknown) and that they had a child in July 1891. Shortly thereafter, in August 1886, Oneida files for divorce. Please note that the couple was married in 1881 not 1871. It seems that the two lovebirds were back together after all because it is reported that in March 1887 the police came to their house and recovered goods previously stolen by Peter Tourville who was then arrested. 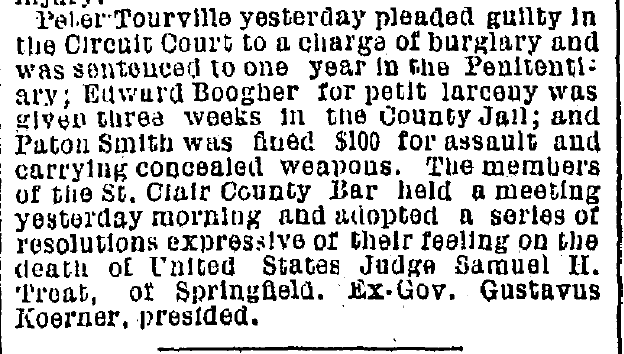 Then, the following month, Peter Tourville pleaded guilty and was sentenced to one year in prison and sent to the Chester Penitentiary in Illinois. A month later, in May 1887, Oneida filed for divorce probably for good this time as I was able to trace a marriage between Oneida Alexander and Thomas Henry Smith, in East St. Louis, Illinois, on October 25, 1888. So it is credible to think she was born around 1866, meaning that in 1880, when she was in East St. Louis, Missouri working as a servant, she would have been only 14 and not 16 as declared. Unfortunately, I haven’t discovered anything more about her family. One can assume this is where she met Peter D. Tourville because they were married in St. Louis, Missouri the next year. 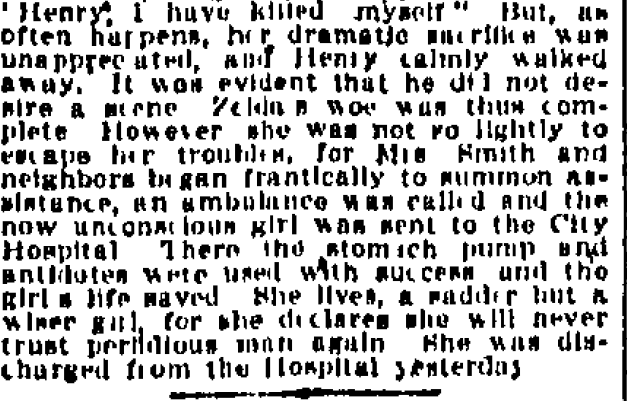 I did some additional digging and found in the St. Louis Obituary Index an entry for Zelda Smith also known as Lillie Mae O’Brien for 1943. The death certificate online confirms that Lillie Mae O’Brien was born February 22, 1882 and was the daughter of Peter Tourville and Oneida Alexander, married to Thomas O’Brien. Furthermore, the informant was Mrs. Onedia McNulty. I found her in the 1920, 1930 and 1940 US Census in St. Louis, she was born in 1895. At one point, she is living with her nephew Francis Smith, born around 1914. 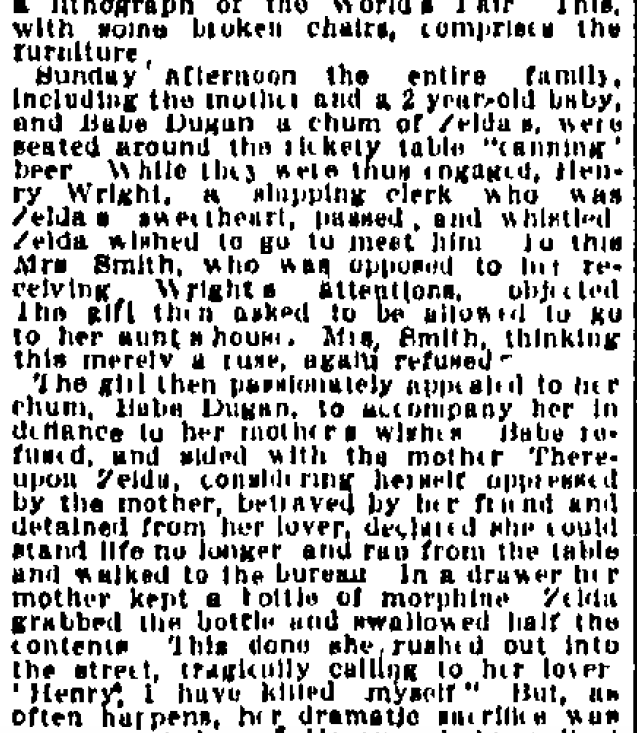 So can we assume that the three children mentioned in the article are Lillie Mae (or Zelda), an unknown male child and Onedia Smith, later married to William McNulty. In 1910, Onedia Smith was an inmate at the St. Louis Industrial School, a penitentiary for juvenile delinquents.